rec. June-October 1926 (Planets) and September 1929 (Marching Song), Columbia's Large Studio, Petty France, London; October 1937, EMI Abbey Road Studio No. 1, London (RVW). I was delighted to receive another recording from The Naxos Historical Collection. This acclaimed series provides the listener with the opportunity to hear both legendary radio broadcasts and studio recordings from the most illustrious figures in 20th century music. On this issue entitled The Composers Conduct we are treated to vintage recordings from two late-Romantic English composers conducting their own works. The renowned restoration engineer Mark Obert-Thorn has successfully remastered pre-war American Columbia shellacs and US Victor Gold label pressings. Not too many years ago, owing to the likelihood of experiencing a primitive re-mastering, I would have actively avoided hearing old recordings such as this. Tremendous strides have now been made in this field thanks to recent technical advances and the restorative expertise of leading audio engineers such as: Mark Obert-Thorn for Naxos and Michael J. Dutton for his company Dutton Laboratories. In my personal CD collection there are many favourite works for which I have accumulated a large number of versions, both for reasons of pleasure and study. My exposure to these two English orchestral masterpieces has been very different as I have listened to only a small number of alternatives. 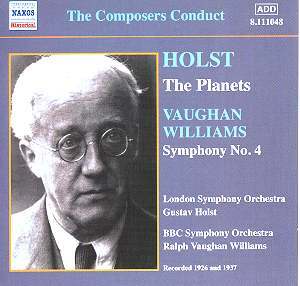 In the early 1980s I purchased one vinyl recording of Holst�s The Planets and one of Vaughan Williams�s Symphony No. 4, performances that served me well for many years. My vinyl version of the Holst The Planets was James Loughran conducting the Hall� Orchestra, circa 1975, on Classics For Pleasure CFP 40243 and my vinyl copy of the Vaughan Williams Symphony No. 4 had Sir Adrian Boult conducting the New Philharmonia, recorded in London in 1968, as part of a treasured 7 LP box set of the complete symphonies on EMI SLS 1547083. I was so content with my digital versions of both scores that I felt no desire to replace them or add alternatives. In view of the age of this Naxos Historical issue I have decided not to provide comparative reviews and I will write my opinions on the Holt and Vaughan Williams conducting performances as I hear them. Holst with the London Symphony Orchestra also conducts the Marching Song No. 2, from his two Songs Without Words, Op. 22 from 1906. It is an inconsequential work that was recorded at the same sessions and used as a filler to the original disc of Mercury in 1929. I wouldn�t take issue with the notes that accompany this release offering the viewpoint, �Although neither composer could claim to be a natural-born conductor, these landmark recordings � offer undimmed and thrilling recorded testaments.� I thoroughly enjoyed these fascinating and well performed interpretations and they contain a sound quality remarkable for their age. I certainly won�t be dispensing with my treasured digital versions but it is wonderful to have such amazing historical audio documents of two great English composers conducting one of their masterworks. Despite the obvious drawbacks resulting from the age of these recordings this was a release that I enjoyed from start to finish.